This carpet in Sardinian wool features distinctive lively polychrome decorations combining textile modules taken from tradition and designs by the designer-artist Eugenio Tavolara, especially developed in the fifties for the village of Bolotana. The decoration of this woolen carpet reproduces a local traditional design characterised by fine geometries woven in skilful tonal variation, using exclusive yarns dyed with natural colors obtained from local plants. 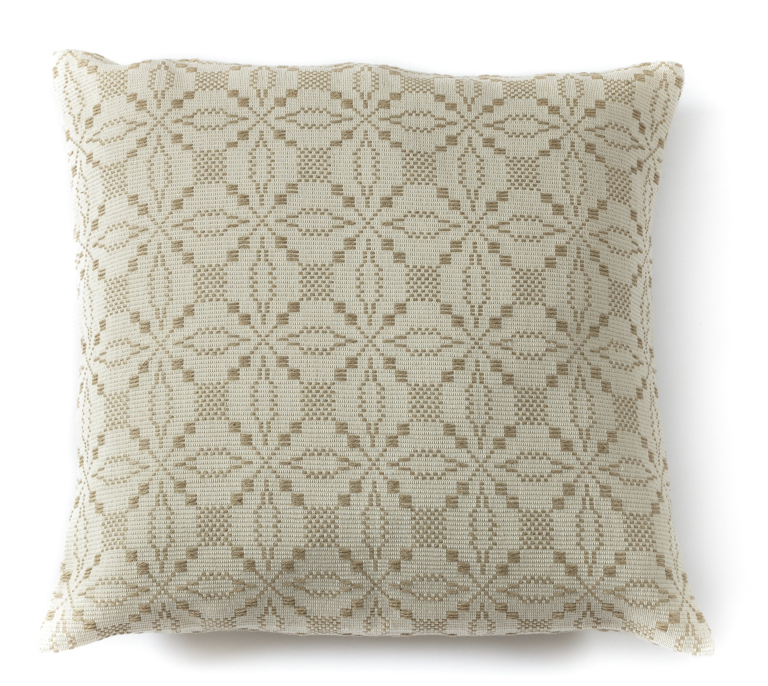 This fabric cushion, woven on a traditional heddle loom, features an elegant geometrical design crafted on a neutral raw linen cloth. This linen towel woven on a flat handloom is decorated with a frill and refined with long macrame fringes. This precious and exclusive artefact is a fine piece of craftsmanship, an enhanced artefact of daily us. A perfect home textile accessory. This cotton and Sardinia wool carpet features a balanced wide geometrical decoration with musk green weaves on a neutral field, and purple parallel stripes. Laboratorio Tessile S’Iscaccu, opened in 1995, includes three members with different vocational profiles and decades of experience in the industry. Skilled in the use of flat handlooms, with particular experience in heddle looms, they set their tools to weave specific fabrics. Being skilled artisans and experts of traditional motifs, they carry out their experimental work using alternative materials, such as chiffon and silk organza, and developing new crafting techniques. In their workshop in Bolotana, a village in the heart of Sardinia, in the Province of Nuoro, the artisans weave beautiful carpets with balanced compositions, including stylized elements and geometric patterns, each of which with its own name and meaning, items of the local jargon of local weavers. Specialized in the manufacturing of Sardinian home textile accessories and carpets, they have had several partnerships with local designers. Products include rugs, pillows, towels, table runners, but also different types of bags and fashion accessories. Featuring motifs inspired by tradition and vibrant colours obtained from local plants, weaves can be adjusted to specific needs, thanks to a vast range of consolidated combinations. The raw materials used are wool, cotton, linen, either woven as warps or wefts, but also silk and cloth. The techniques used are the traditional a pettenedda, a rànu, a mustra, that is, traditional stitches with a deep contemporary touch.